April 2, 2010 - TIROS-1-the first Television and Infrared Observation Satellite-and its successors revolutionized weather observation and forecasting. Lockheed Martin and its heritage companies built every one of the TIROS series of spacecraft, from TIROS-1- launched on April 1, 1960- through NOAA-N Prime, launched on February 6, 2009. "We at Lockheed Martin are enormously proud of our long-standing partnership with NASA and NOAA, and congratulate them on this very momentous anniversary," said Joanne Maguire, executive vice president of Lockheed Martin Space Systems Company (LMSSC). "Fifty years ago, about the best an ordinary person could do to predict the weather was look out the window and report back. Today, the data accumulated by these satellites over five decades, and the sophisticated weather models they drive, enable reliable forecasts out to seven days. We cannot change the weather, but it is very satisfying to have played-and continue to play-a role in creating the tools that allow us to prepare for it and mitigate its impact on our lives and livelihood." The TIROS-1 satellite was built by RCA Astro Electronics in East Windsor, New Jersey. The General Electric Corporation purchased RCA in 1986 and Astro Electronics was renamed GE Astro Space. Martin Marietta acquired it in 1993, and it would become part of Lockheed Martin when that company merged with the Lockheed Corporation in 1995. TIROS-1 demonstrated the advantage of mapping Earth's cloud cover from satellite altitudes. The first views revealed clouds banded and clustered in unexpected ways. The mission also succeeded in verifying experimental television techniques designed to develop a worldwide meteorological satellite information system, and testing Sun angle and horizon sensor systems for spacecraft orientation. While the satellite operated for only 78 days, it paved the way for far more robust spacecraft that have made a lasting impact on weather prediction. In all, 44 TIROS satellites were launched between 1960 and 2009. Through five decades of service, they have earned the reputation as the workhorses of the Civil Space Earth-imaging inventory. 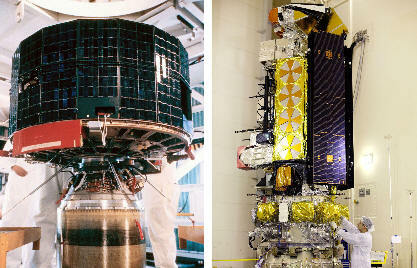 The current generation of civilian weather satellites has a direct lineage to TIROS-1. The Advanced TIROS-N satellite series are called Polar Operational Environmental Satellites (POES). The satellites are acquired and launched by the National Aeronautics and Space Administration (NASA), and once on-orbit operated by the National Oceanic and Atmospheric Administration (NOAA). A constellation consists of two POES satellites circling the planet in nearly north-south orbits. As the Earth rotates, the entire globe, one swath at a time rolls into view of the satellites' instruments. The satellites provide measurements of reflected solar and radiated thermal energy from land, sea, clouds, and the atmosphere in the visible and infrared spectrum, atmospheric soundings of temperature and humidity, measurements of global sea surface temperature, aerosol distribution data, ozone concentration data, soil moisture data, and measurements of orbital proton and electron flux. Together these data comprise irreplaceable inputs to the numerical weather forecast model and are vital to medium and long-range forecasting. Separately or in combination, the data are utilized to produce sea-surface temperature maps, ice condition charts, vegetation maps, and other forecasting and management tools. Data from these spacecraft also support a broad range of environmental monitoring applications including weather analysis and forecasting, climate research and prediction, ocean dynamics research, volcanic eruption monitoring, and forest fire detection. Additionally, POES satellites - and NOAA's Geostationary Operational Environmental Satellite (GOES) satellites - carry two search and rescue instruments that are used internationally for locating ships, aircraft, and people in distress. The use of satellites in search and rescue has been instrumental in saving more than 24,500 lives since the inception of the Search and Rescue Satellite-Aided Tracking (SARSAT) system. POES satellites also collect data from remote platforms and provide direct broadcast of environmental data worldwide. NASA's Goddard Space Flight Center, in Greenbelt, Md., is responsible for the procurement, development, launch services, and verification of the POES spacecraft, instruments, and unique ground equipment. Following spacecraft launch, Goddard is responsible for satellite health and safety during a comprehensive on-orbit verification period that lasts 45 days. Following satellite checkout, NASA turns operational control over to NOAA, which operates the satellites from its Satellite Operations Control Center along with the nation's other environmental satellites. NOAA's environmental satellite system is composed of two types of satellites: POES for global, long-term forecasting and environmental monitoring; and GOES for national, regional, short-range warning and "now-casting." Lockheed Martin and its heritage companies built all of the POES satellites going back to the very first weather satellite launched on April 1, 1960, and is currently developing the next generation GOES-R satellite system, with a first launch set for 2015. Both GOES and POES are necessary for providing a complete global weather monitoring system. LMSSC is a major operating unit of Lockheed Martin Corporation, designs and develops, tests, manufactures and operates a full spectrum of advanced-technology systems for national security and military, civil government and commercial customers. Chief products include human space flight systems; a full range of remote sensing, navigation, meteorological and communications satellites and instruments; space observatories and interplanetary spacecraft; laser radar; ballistic missiles; missile defense systems; and nanotechnology research and development.